Readers of our arts coverage lately know we've devoted a lot of ink to donors supporting large capital projects at major arts institutions. Many of these institutions have been bitten by the "Bilbao Effect" bug—the idea that an architecturally exciting project makes an institution more of a destination. But it isn't just mega-museums like the Museum of Modern Art that catch the fever. Universities and smaller organizations are susceptible to the effect, as well. Take recent news out of Bloomington, Indiana, where Indiana University (IU) Art Museum announced a landmark gift of $15 million from Indianapolis-based philanthropists Sidney and Lois Eskenazi. This is the largest cash gift in the museum's history and a lead gift toward renovation of its building, which opened in 1982. What's more, the Eskenazis are also donating their collection of nearly 100 works of art, composed primarily of prints by 20th-century European and American masters. The museum will be renamed the Sidney and Lois Eskenazi Museum of Art in recognition of the couple's generosity, effective immediately. The gift suggest that big cities, quite naturally, needn't have a monopoly on world-class art and awe-inspiring buildings. In that sense, new out of Indianapolis reminds us of recent developments in Denver, where developer John Madden donated 120 pieces of art, valued at roughly $10 million, to the University of Denver. So what about Sidney and Lois Eskenazi? Lois and Sidney Eskenazi's family business, started by Sidney in 1963, is one of the nation’s leading real estate development companies, managing more than 70 properties in 23 states. They've been supporting Central Indiana organizations ever since. Most notably, in 2011, the couple gave $40 million for a new hospital and medical campus in Indianapolis, now known as the Sidney and Louis Eskenazi Hospital and Eskenazi Health. It was one of the largest gifts ever made to a public hospital in the U.S. at the time. The couple has also provided crucial support to Indianapolis' Herron School of Art and Design. 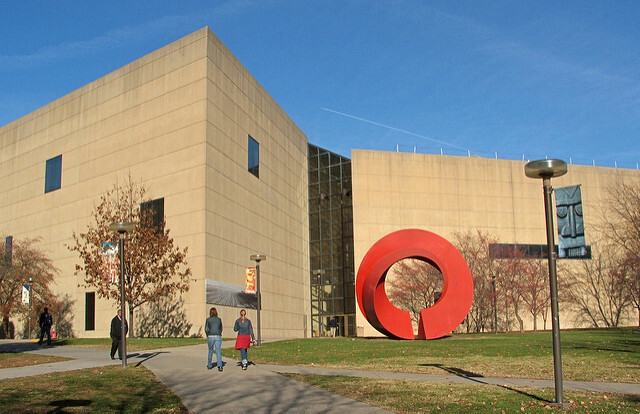 In recognition for their gift to Herron's sculpture and ceramics facility, the school remained the facility the Sidney and Lois Eskenazi Fine Arts Center. In fact, last year Indiana Gov. Mike Pence presented Sidney and Lois Eskenazi each with the Sagamore of the Wabash, one of the state’s highest individual recognitions, at a special ceremony for their philanthropic work. Indianapolis Museum of Art represent the future of museum audience engagement.